Who has never eaten chicken-on-a-stick? I don't think there are many of us to be honest - whether they are breaded, fried or slathered and bathed in some sweet sticky sauce. Well today, I lightened up my skewers and made a little healthier version using a spice blend called Za'atar which is indigenous to Middle Eastern countries such as Palestine and Lebanon. Za'atar can be found in Middle Eastern and some whole foods and farmers markets where the spices are sold. This wonderful combination consists of ingredients such as lemony sumac (great on chicken) thyme, toasted crushed sesame seeds, oregano, marjoram, salt and sometimes depending on the region basil and savory. Search out Za'atar in your area this week - it's great on pizza, garlic bread, sprinkled over salads, added to veggies, soups and stews. It’s fab kids and really good for you! 1. First, soak the wooden skewers in hot water for at least 15 minutes or longer while you prepare the rest of the dish (this will stop them from burning when you grill.) In a small bowl, mix together the olive oil, lemon juice and zest, Za’atar seasoning, dried parsley, crushed garlic, ground pepper and salt - blend well and set the marinade aside. 2. Depending on how large the chicken breasts are - split them horizontally - and slice them into long strips. 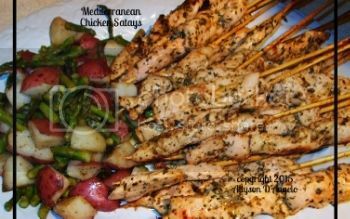 If you are using small skewers, usually one long strip will be sufficient - larger skewers will probably require 2 strips of chicken. Place the chicken in a large bowl or Ziploc bag and add the marinade. Marinate for 30 minutes then skewer the chicken onto the skewers. 3. Preheat an indoor or outdoor grill on a medium-high flame and get it nice and hot! Brush the chicken with a little more olive oil before placing them on the grill. The skewers will take no time to cook at all, approximately 2 minutes per side, turning only once - and on this flame setting you should get some nice grill marks really fast. Do not try and turn the chicken if it resists - the chicken is basically telling you to leave it alone because it's not ready to be turned yet. It will release itself when ready and you can just finish it off on the other side. Serve the chicken skewers with a tzatziki sauce - which is a Greek sauce usually consisting of any of the following ingredients: - plain yogurt, cucumber, lemon juice, salt, garlic, olive oil, mint or parsley. Tzatziki is usually available in your grocery store where the hummus is sold.